This week’s blog is provided by Rhona Meehan at Ayrs & Graces B&B in Ayrshire, the birthplace of Robbie Burns. In 1759 Robert Burns was born in that small simple cottage, right here in Alloway That “ Auld Clay Biggin” as Burns himself described it, now attracts thousands of visitors from across the world each year They come because the writings of Burns touch their hearts and their minds with their genuine warmth, biting satire and gentle simplicity, in a way few other writers have managed to achieve. And the fascinating thing is, that this poetic lamp, in the glow of which so many have been enlightened, all began right here. Yes, we are indeed very fortunate to live in such a beautiful and historic part of our country. The tradition of the Burns supper in recognition of Burn’s life and work began shortly after he died. The first recorded Burn’s supper occurred in1801. It was held in Burn’s cottage which at that time was an inn. There are some who disapprove of a female presence at Burn’s suppers, which seems at odds with the poets own life and ignores the fact that a lady, Primrose Kennedy of Drumellan attended that first dinner. 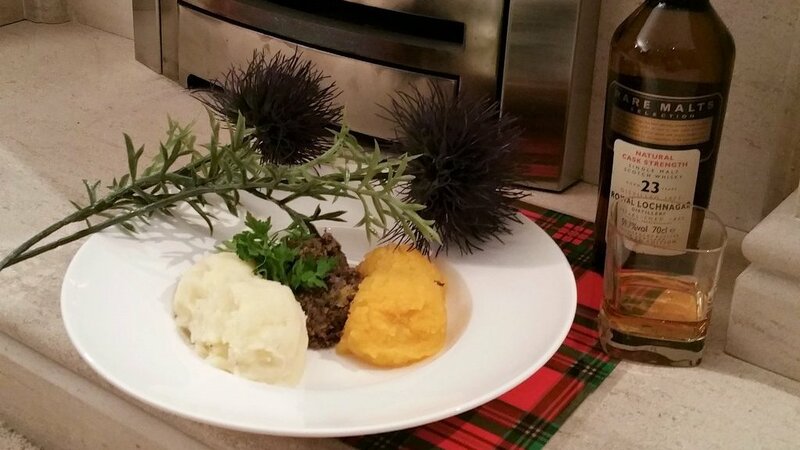 Our thanks to Rhona Meehan Ayrs and Graces – Traditional Burns Supper of Haggis, neeps and tatties (mashed turnips and potatoes). On the 25th of January of each year and for a few days before it and after it there is not an hour in the day or night when a Burns supper is not taking place somewhere in the world. This year, Burns suppers will be held in over 200 countries of the world and translated into over 50 languages. Why should this be? After all, no other writer of any nationality has been afforded such universal acceptance. It cannot be just for his poetry – for every country can boast of it’s poets. Nor can it be on account of his prose -- Scotland has after all produced two of the worlds greatest prose writers in Sir Walter Scott and Robert Louis Stevenson. Yet neither is revered to the extend that Robert Burns is. So why did the star o’ Rabbie Burns rise aboon them a’ and why does that star shine more brightly than any other in the firmament of Scottish life and Scottish history? Perhaps it was because of what he did to preserve the literature, the language and the heritage of Scotland -- and he certainly did more than any other. He wrote against the cultural tide running at the time and he wrote in his native tongue in the teeth of prejudice against that language. But perhaps it is because he wrote with a beauty and simplicity that no writer, before or since, has managed to achieve. Thirty simple unforgettable words, everyone a monosyllable, -- No one else could write with such simplicity. No matter the type of writing, his work was always supreme, but it is when we consider his love songs we see the perfection of Robert Burns. For all the love songs which flowed from his pen are without equal. A dozen simple words, but what words do you know in any language that convey more. Look at the quality of his works; In Tam o’ Shanter we have one of the greatest tales in any language; In Holy Wullie’s Prayer we have a great satire. Look at the range of his writings. In his works we see the whole cosmos of man’s experience and emotion, from birth to death. Our thanks to Gordon Bulloch at The Dulaig, reciting the Address to the Haggis at a Burns Supper. All of the foregoing perhaps explain the immortality of the memory of Robert Burns the nationalist, to the Scots. But what about Burns the internationalist? On 25th January 1759 Robert Burns was born in a small cottage in Alloway. He would become Scotland's favourite son and national bard - an extraordinary poet, egalitarian and international icon. His works are a cornerstone of Scotland's literary heritage. His legacy has held strong for over two centuries. In the village of ALLOWAY we have ROBERT BURNS BIRTHPLACE museum and is the ideal place to discover both the man and his works. Do come and visit the world class attraction that boasts a contemporary cafe, gift shop and exhibitions. This flagship museum encompasses sites across the village of ALLOWAY taking you from the open air tributes to landmark buildings from the bard's life.